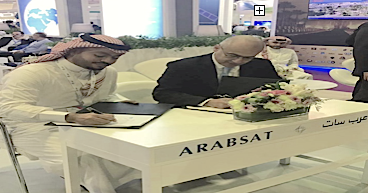 There is a new musical channel, One TV, that began broadcasting exclusively on Arabsat's BADR-6 satellite, additionally mtv Lebanon HD has struck an agreement with Arabsat that expands their viewership. mtv Lebanon HD has just started the new year by broadcasting on Arabsat BADR-4 satellite at 26 degrees East, expanding its viewers reach from MENA to Europe. In addition, the new musical channel One TV also began broadcasting over satellite for the first time, exclusively on Arabsat's BADR-6 satellite. mtv Lebanon and Arabsat have signed a long-term exclusivity agreement for both channels to begin in 2018. Eng. Khalid Balkheyour, Arabsat President and CEO said mtv Lebanon is the pioneer channel in addressing self-regulation and a clear code of ethics since the creation of the channel in 1991. Since then mtv Lebanon has noticeably invested in delivering premium entertainment content to the region, a strategy that matches what Arabsat’s aspirations are therefore we are proud to have their channel on Arabsat BADR-4 at 26 degrees E exclusively. He continued that by choosing BADR satellites, mtv Lebanon HD and One TV will enrich their TV neighborhood at 26 degrees East, and Arabsat is committed to continuing its efforts to attract premium broadcasters to provide and add value to Arab communities DTH experience, with crystal clear pictures and first-class content.